The Great Lakes of North America are massive. While us Americans and Canadians seem to overlook them when we look at the map because we’re so used to seeing them, they in fact take up a ton of real estate. They’re the largest fresh water lakes in the world, and if you were standing in Downtown Chicago looking out across Lake Michigan, you would think it was the ocean as you can’t see across it. The Great Lakes have played a huge role in building up the Midwest and many of North America’s largest cities reside on them. While the lakes are connected to the Atlantic and Gulf of Mexico, only smaller boats can pass through the lock system. 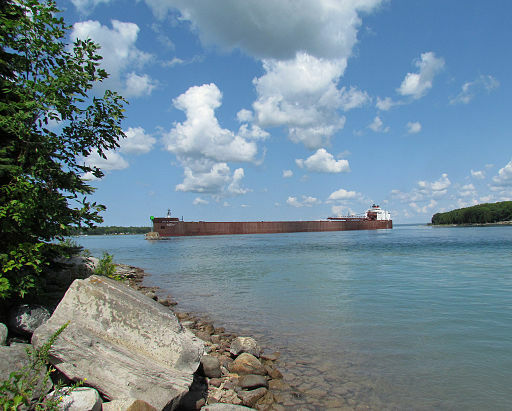 There are actually massive ships that just sail around the great lakes, moving raw materials and cargo around. The largest ship in the great lakes is pictured above, the humongous MV Paul R. Tregurtha. This behemoth was built back in 1979 and is still in service. Its total length is 1,013 ft (309 m), has a depth of 56 ft (17 m) and can haul 14,497 tons of cargo, all while never setting “foot” in an ocean. You might get on fine in a dingy with no training, but you better do a little Google search for “boat license Canada” before getting behind the wheel of something in the Lake Freighter class like the MV Paul R. Tregurtha!